Hot dog stands across Los Angeles should be shaking in their boots right now. 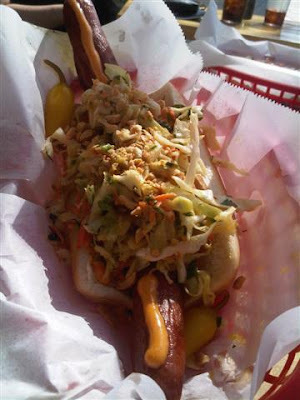 Ray Byrne of The Slaw Dogs in Pasadena has taken hot dogs to a whole new level. 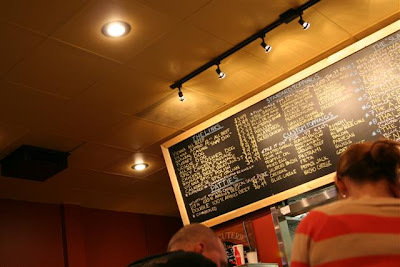 Indecisive people stand frozen in place staring at the Slaw Dogs menu. Other diners are truly inspired, practically giddy at the wealth of choices. Some of us are still talking about the toppings days later. It all starts with the dog. 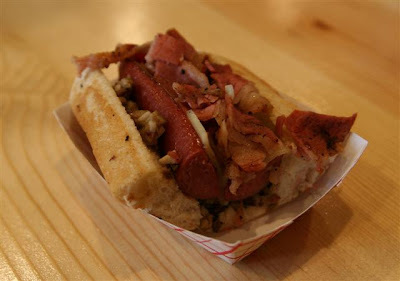 There are all beef dogs, natural casing dogs, kosher dogs, bratwurst, two kinds of chicken dogs, and even a veggie dog, among others. 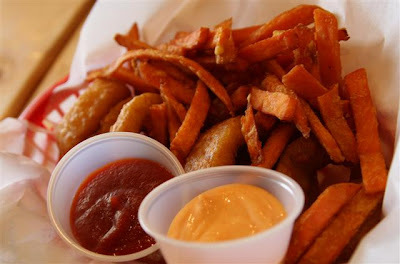 You can have your dog grilled or “rippered” Jersey-style, thrown into the deep fryer until it splits. 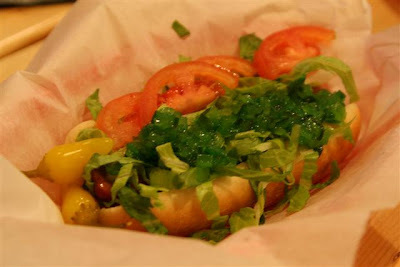 There are 27 standard toppings, including sesame mayo, curry ketchup, pickled onion, jalapeno, chipotle mayo, and even sport peppers if you want to make a Chicago-style dog. 25 custom toppings, for an additional 99-cents, give you choices like bacon, pastrami, roasted pasilla peppers, jalapeno, chili, kimchi, thai-slaw, a fried egg and a number of different cheeses. Not a do-it-yourself-er? 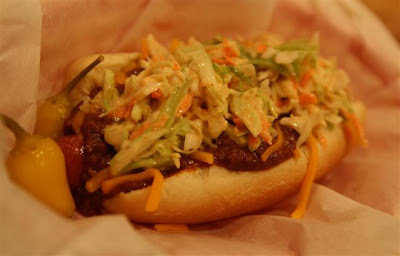 “The Original” sports chili, cheese, mustard, onions and cole slaw. 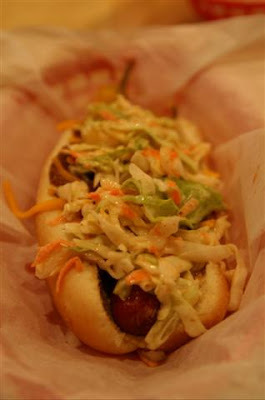 The slaw is unusual on a hot dog, but it works, adding a refreshing crunch. In fact, that is one of Ray’s skills. 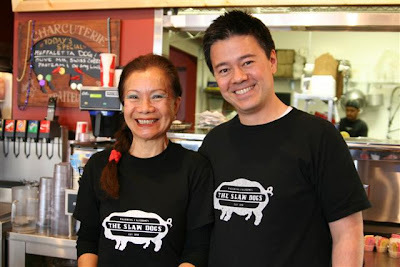 He is able to take seemingly clashing flavors and make them work together. One recent special included a jalapeño kumquat chutney that blew me away. The special muffalata dog (olives, pastrami, and Swiss) really worked. At this point the Slaw Dogs is going to have to take out a restraining order on me. Two of the wilder dogs are the “Green Monster,” (roasted green chile, chipotle mayo, grilled onion, pepper jack and spicy garlic salsa) and “The TNT Super Dog” the latter which brings back memories of the Oki Dog, with a 12″ rippered dog, chili, cheese, bacon, pastrami, fries and grilled onion swaddled in a burrito. If that’s not enough, you can also request a fried egg. 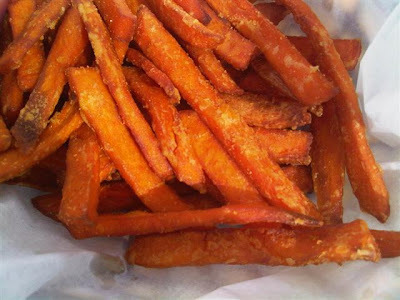 Don’t forget to order the sweet potato fries, perfectly crisp and completely greaseless. 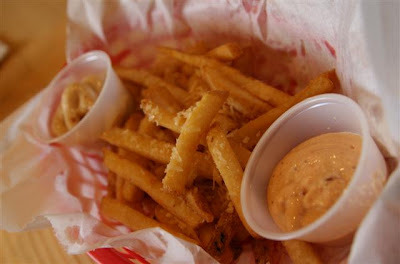 There are also fry specials, most recently the truffle and Parmesan fries. I don’t know how they are going to ever take them off the menu without a riot ensuing. 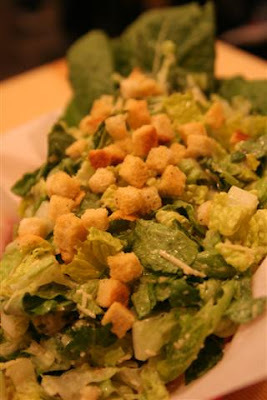 There are also big, fresh, crunchy salads. Salad, shmalad. The irony is that owner Ray Byrne didn’t even eat a hot dog until he was 20 years old (It was at Pink’s). 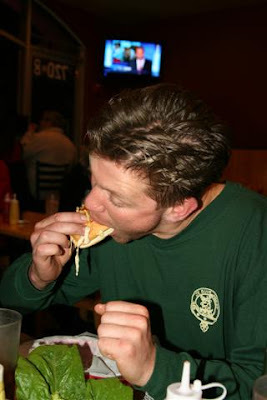 He first considered a burger palace, but decided the hot dog would be the perfect vehicle for his creativity. Little does Pink’s know it, but there’s a new sheriff in town. Move over, little dog. The big dog’s movin’ in. 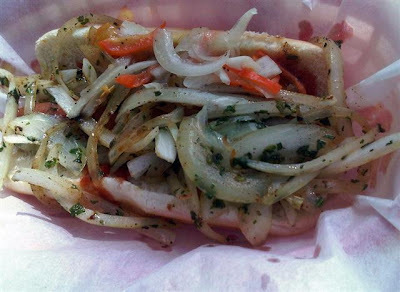 This entry was posted in hot dogs, Pasadena. Bookmark the permalink.